Class O Armaflex Selfseal pipe insulation is a thermal insulation product fully slit along each length with two strips of double sided self adhesive tape pre-applied to each open slit surface. 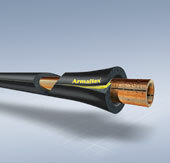 Armaflex pipe insulation is specially developed to provide insulation where fast, secure installation is required and ideal for applications where working space is severely restricted, Class O Armaflex Selfseal pipe insulation is easily applied by fitting the insulation and peeling back the self adhesive tape. With its exceptional, inbuilt, water vapour barrier Armaflex is particularly effective at preventing moisture ingress and ensuring long term thermal efficiency. The thermal properties of Armaflex will not rapidly deteriorate over time as other insulation materials may and, by keeping moisture as far from the pipe surface as possible, Armaflex reduces the risk of expensive under insulation corrosion. The in built water vapour of Armaflex comes from its closed cell structure. Armaflex comprises thousands of interconnected closed cells, each with an inherent resistance to water ingress. As such the vapour barrier of Armaflex cannot be compromised by surface punctures or tears. In addition Armaflex is dust and fibre free. It will not emit any particles or fibres, even when cut into shapes and fittings. You might also like to consider Eurobatex Class 0 or K-Flex Self Seal.